Before we introduce ourselves, I would also like to thank Ms. T’uy’t’tanat-Cease Wyss for her traditional welcome and all the work she does educating Vancouverites through her art and storytelling. It is a humble reminder that we as settlers have much to learn, listen and gain from the First Nations/Indigenous communities that we are all settlers on. My name is Will Tao (pronouns: he/him) and this is my colleague and one of the lead event organizers Fatimah Yasin, and we are privileged and humbled to be Outgoing Members of the City of Vancouver’s Cultural Communities Advisory Committee. Our Committee, which served for a year and a half just immediately prior to the election was given a mandate to advise Council on enhancing access and inclusion for Vancouver’s diverse cultural communities to fully participate in City services and civic life. Today marks the second of our Voices of Vancouver initiatives and our Final event of our term, and fittingly so. The very inspiration for us to turn our strategy from inward meetings at City Hall to outreach into diverse communities was because of Islamophobic protests and the powerful counter-protests that took place in August 2017. We recognized that while we were proud of those who stood up to combat racism and Islamophobia, we couldn’t help but recognize that some voices were missing even from those protests. Speaking to individuals after, they were afraid as newcomers, as Muslim-Canadians, as hijab-wearing Muslim-Canadian women, to go into a public space to stand up and speak out. Our first Voices of Vancouver event, taking place on March 23rd, with the International Day for the Elimination of Racial Discrimination – where we had speaker and our good friend, Noor Fadel, speak to youth, many of whom were Muslim-Canadian, about her experiences as a victim of a hate crime. We provided bystander training that really brought to light how our conscious and unconscious biases affect our interactions and make some of us more vulnerable and susceptible to discrimination. 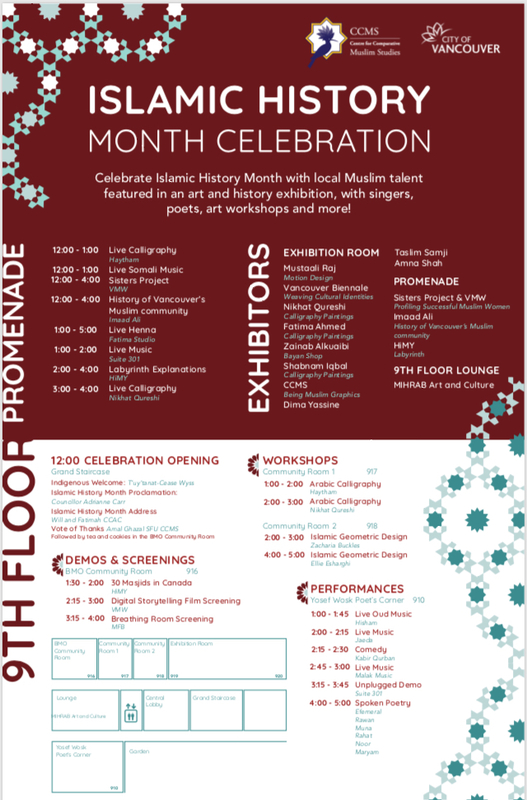 Around the same time, Councilor Andrea Reimer, reached out and asked us if we could take the lead on organizing a first public celebration for Islamic History Month on behalf of the City. So here we are today. With a little bit of hard work and a lot of sleepless nights. Although I will let Aslam, the lead organizer speak to that shortly. Now to some more salient content and context for today’s event. The word “History.” I believe that we cannot celebrate Islamic History Month without recognizing the roots of all Muslim-Canadians as part of the history of the Canadian Confederation. As you will soon learn from Imaad Ali in his interactive display, we know as a historical fact that there were Muslims in Canada prior to Confederation in 1867, that by 1911 BC had the most Muslims in the country, and that by 1912, when the Komagata Maru arrived there was a local Muslim on the shore committee who managed to get permanent residence in Canada. We know that in 1965, Vancouver’s first Mosque, the Jamia Mosque was established on West 8th and operates to this date, still serving as a homeless shelter when temperatures drops. As you can see from just these few snippets, this is a continuing, and evolving historical narrative that we must continue to tell and share to remind all those who come that there was a foundation – paved by Muslim Canadians. Islam is not a newcomer religion or a Middle Eastern religion. It is a Canadian religion. Indeed, by 2036, Statistics Canada estimates that between 5.6% and 7.2% of the total population of Canada will be Muslim. With increased numbers, we hope will become increased focus, study, and a deeper look at how we can integrate Muslim ideas and culture into our Canadian social fabric – work I know the Centre for Comparative Muslim Studies at SFU has already been doing and continues to do as lead organizers of this event. 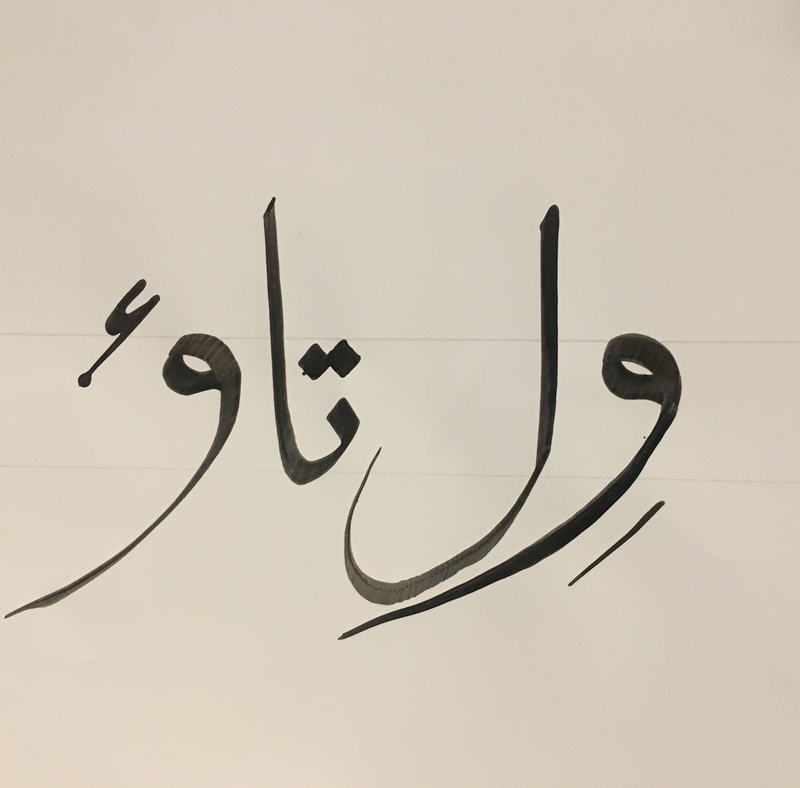 In boldly stating that Muslim ideas have a place in Canada’s future, I challenge anybody who argues that the recognition that the way we spend our substance – however much of that we cherish, upon family, orphans, the needy, newcomers, the homeless, and freeing those from the bonds of misfortune, be it drug addiction or trafficking, is not fundamentally Canadian. Our Charter values aim to protect the rights of those very groups facing historical subjugation that this Quran passage just highlighted. We can keeping enunciating differences between us or we can find those unique synergies and strengthen them. I pitch today for the latter. This leads to my next point, before I pass it on to Fatimah to share her experiences organizing this event, – we need to also accept our shortcomings as we move forward. As a City (writ large), we haven’t heard your voices, Muslim voices. We haven’t given you space to celebrate, engage, and share your perspectives. To lead. To be empowered. Case in point, not a single Muslim-Canadian has ever served as a City Councilor in Vancouver. The last South Asian City Councilor elected was in 1972. Intersectionally, we have never had a South Asian (let alone Muslim) woman City Councillor. This also isn’t just a Vancouver phenomenon. Recently in Toronto not a single Muslim-Canadian was elected to Council on 24 wards. Only one hijab-wearing female politician has ever been elected to public office in Canada, Ms. Ausma Malik, as a School Board Trustee and when her ward was eliminated and she chose not run in the past civic election. How do they see us if we are not there? Therefore, we cannot speak of reconciliation broadly as a City without facing every single one of our Cultural Communities, examining how they have become our neighbours and Citizens and increasing not only our own cultural humility in integrating them into our lives but allowing them opportunity to integrate us into their stories and their narratives (attending events such as today, I propose is a good start but only a start). Similarly, while we step forward to change, we also need to look behind traditional power structures and see how that might involve us stepping back and allowing others to have a share of the podium, and that power – that their success can be our success. As Allama Iqbal, the great Pakistani poet, once wrote – words without power is mere philosophy. Finally I hope as today as you listen to the music, laugh at the comedy, trace your brush through the calligraphy that you don’t forget your role in helping to facilitate conversation, to elevate voice and to help empower this diverse Muslim community that this City is proud to help, and along with that all our diverse ethnocultural and Indigenous communities. Thank you.